My last blog caused a bit of a storm in the proverbial teacup over a lack of meaningful support for drought affected communities from a State Government spruiking a surplus, and resulted in a few comments about whinging CWA women. I decided those comments warranted some response in regard to how far a good whinge can sometimes take you, after all doesn’t “the squeaky wheel gets the grease”? I thought I might take a trip down memory lane and see just how much our whinging had achieved over the years for women, children and communities across NSW over our 93 year history. What I found in our accessible data amazed even me! 1960 “That in view of the high drowning rate, especially young children in lagoons etc. could not more be done to educate the public in the latest methods of resuscitation. 1976 “That manufacturers of food stuffs be required to print on the labels of containers the specific ingredients used in the preparation of the contents”. 1977 “That persons who wish to donate organs for transplant carry some means of indicating this, and that the Department of Health be urged to investigate the most suitable means by which intending donors be identified”. 1977 “That the Association press (the Government) for the establishment of Mobile Cancer Detection Units to regularly visit, at least every two years, those areas of the state of NSW where the facilities of Permanent Cancer Centres or Clinics are not easily available to all residents, and to actively encourage young Radiologists to undertake specialist training to become experts in all types of cancer”. 1978 “That CWA of NSW urge the Department of Health to prohibit smoking in public eating houses”. 1980 “That the CWA urge the NSW Government to introduce random breath tests and reduce the blood alcohol limit to 0.05%, and commend the Government on the Amendment to the Motor Traffic act which now means that there is an automatic suspension of licence for three months upon the first conviction for a drink driving offence”. 1981 “That CWA of NSW request the Minister for Communications to initiate closed captioning on all television stations for the benefit of all deaf and partially hearing persons”. 1983 “That CWA of NSW request the Minister for Health to introduce compulsory labelling of packaged foods showing type, quantity and percentage of all ingredients”. 1983 “That in view of the worsening power situation the CWA of NSW ask the Government to encourage solar heating of water in all homes and business premises”. 2012 “That the policy of the CWA of NSW shall be that the NSW Minister for Primary Industries has Mimosa Bush (Vechillia farnesiana) removed as a native from the Native Vegetation Act and declared a noxious weed”. They, whoever “they” are, say that a week in politics is a long time. I think so much happens, so quickly now, that a week in anybody’s life is a long time; including mine. Almost a week has passed since our building at 11-13 Greenknowe Avenue, Potts Point was sold for $18.4 million to an overseas buyer and I am still trying to find time to process the enormity and historic significance of that event. Modern communications being what they are the news was out before the ink was even on the page, let alone dry! 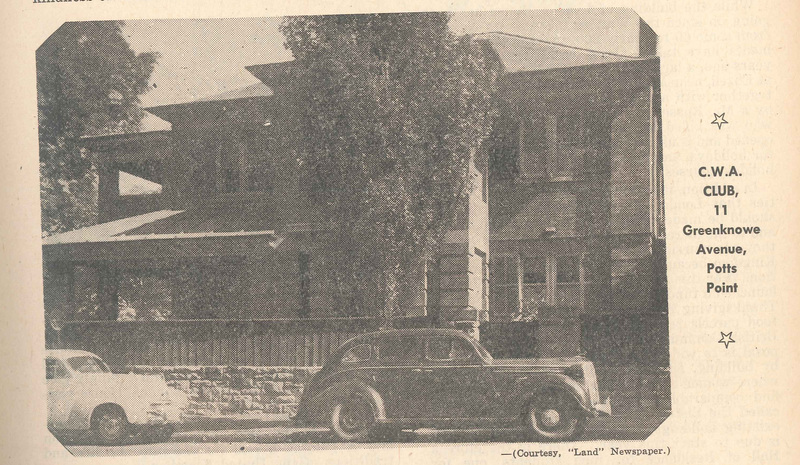 When the building was purchased in July 1953 the President of the day, Barbara Cullen, made the announcement in her Report to the 1954 Conference. Some 10 months later! You know that I am a believer in Karma and eerily, it has shown itself again. As mentioned above we received just over $18,000,000.00 for the site, but did you know it was purchased for £18,000? Don’t you find that a rather large coincidence? The logical thinkers amongst you will say no, just a good return on investment! 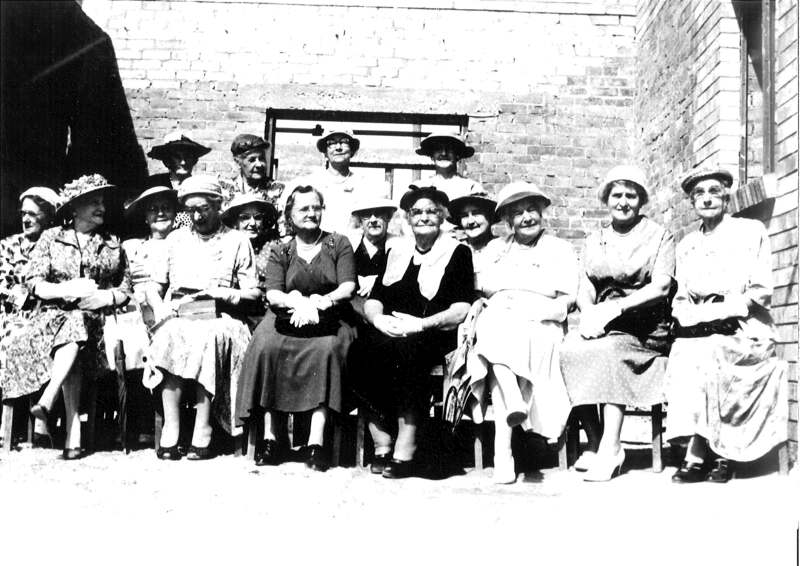 At the time the “Country Life” Newspaper donated £250 to furnish a room in the new Club and members were advised that a wonderful meeting room would be built and that there would “certainly” be room to “house our Handicraft Committee”. I found these interesting little gems whilst researching the history of the building in old copies of The Country Woman (aka the Journal) and by now you must be thinking that I spend all my time perusing the pages of past copies of our Journal. Oh that your thoughts could be true, for they are very absorbing and reveal some thought-provoking reflections of modern times as well as some very different viewpoints and values. 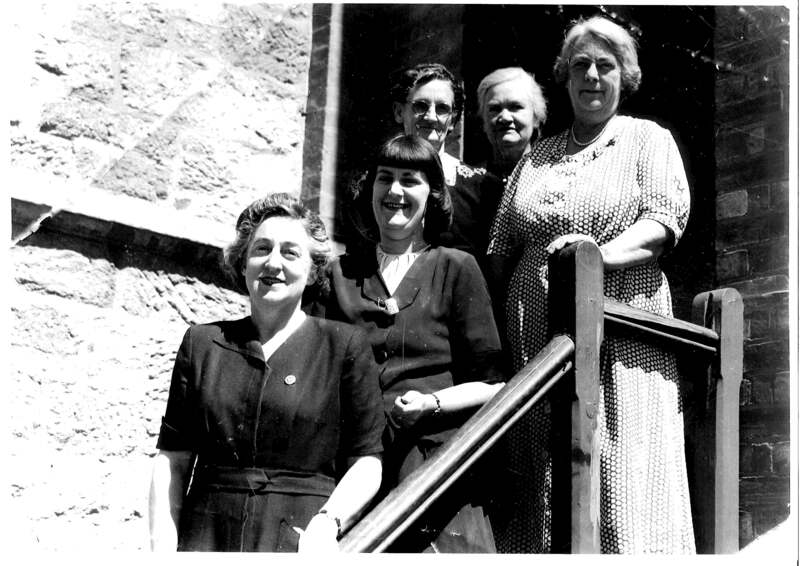 For instance, Barbara Cullen said in her report that “It is at Conference that we find the wishes of the members, and once anything has been passed there by a majority, it is the wish of us all and it is the duty of the Executive Committee to put into effect the resolution which Conference has passed”. I wonder if there was dissent around the purchase of the property, mirroring members’ feelings with the sale? In the same report she spoke about helping migrants who come at the invitation of the Commonwealth. “We can teach them so much and this they can take back to their own countries. We do ask you to befriend them and take them into your homes – in fact, to take all visitors to these shores into your homes”. Are we as open and generous in our thinking now as we were then? In this same Journal it was recorded that 800 delegates attended the 1953 Annual Conference, that there were 30,427 members in 515 Branches and that “we took an interest in the mentally ill and … are hoping to be able to change the attitude of the public towards the mentally ill”. Some things change, some things don’t.